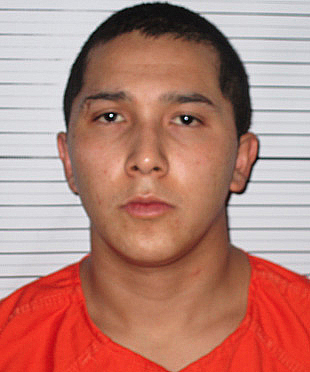 The Artesia Police Department reports an Artesia man is in custody in connection with a shooting incident early Tuesday that left a second local man dead. Daniel Aguilera, 22, is in the custody of the El Paso Police Department at a hospital in El Paso, Texas. Aguilera, who also suffered two gunshot wounds to the torso in Tuesday’s incident, is now listed in stable condition and stands charged with one count of murder in the first degree, a second-degree felony count of aggravated burglary, and a fourth-degree felony count of aggravated assault with intent to commit a felony. Aguilera has been out on bond since being bound over to district court in October 2015 in connection with the July 5, 2015, murder of Andres Rojo in Artesia. At the time of his binding over last October, Aguilera was charged with second-degree murder and aggravated battery with a deadly weapon in the shooting death of Rojo, 27, and the injury of Rojo’s brother, Luis Rojo, 23. Officers were dispatched at 1:39 a.m. Tuesday to the Abo Apartments, 700 N. 10th St., in reference to shots fired. Upon arrival, they found two individuals suffering from gunshot wounds. Otis Chavez, 22, was wounded in the torso and was pronounced dead at the scene. Aguilera was transported to Artesia General Hospital before being airlifted to El Paso. Cmdr. Lindell Smith of the APD says Aguilera has not yet been booked or arraigned but will be upon his release from the hospital. The charges against him carry a maximum penalty of 28-and-a-half years in prison, heavy fines, or both. Aguilera’s bond from the Rojo murder case has also been revoked.